Simplify your breakfast routine with Make Ahead Breakfast Frittata Muffins. With this delicious recipe, you’ll have breakfast prepped for the week. 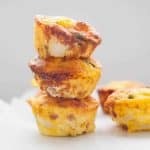 These frittata muffins are packed with flavor and you can even customize them to use up the vegetables you have on hand. Preheat oven to 350 degrees. Grease a muffin tin and set aside. Whisk together eggs and milk. While whisking, be sure to break the yolks of the eggs as much as possible. After your eggs are whisked together (most of the egg yolks are broken up and the overall consistency is a creamy pale yellow liquid), add in the remaining ingredients and continue stirring. Grab a glass measuring cup and scoop out the mixture with your glass measuring cup. Then fill the greased muffin tin with mixture. As you’re pouring, you may need to use a spoon to get the filling out evenly into the cups. You want to fill your muffin tin almost to the top, leaving about a quarter inch for the muffins to rise. Repeat process until all muffin tin slots are filled. Bake in the oven at 350° for 32 minutes, or until eggs are set. The egg muffins are cooked when the eggs are “set” meaning they have cooked solid. The egg muffins shouldn’t be liquid or jiggle if you shake the muffin tin. Allow the egg muffins to cool in the muffin tin for 3 minutes, until cooled enough to handle. Use a serving knife or butter knife to remove the egg muffin from the muffin tin and place onto a wire cooling rack. If you are serving these right away, you can also move them from the muffin tin to a serving platter. If you’re storing for later, let the muffins cool to room temperature on the wire cooling rack, then store in an glass storage container for up to 4 days. If you are omitting the shredded cheese, add an extra egg. Feel free to substitute your non-dairy milk of choice if you’d like to make these dairy free egg muffins. Cooking time may vary so just be mindful of that.